At any sign of drowsiness, Steer will warn you with vibration and gentle electric impulse. Many people guzzle down energy drinks and coffee to stay awake while driving. 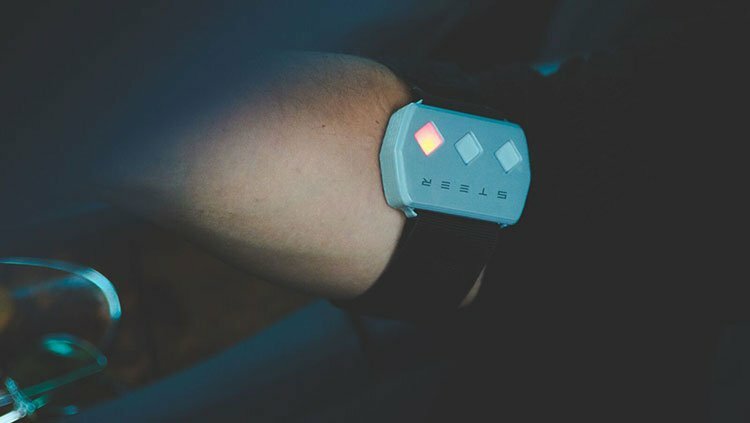 Now you can forget all that – a new bracelet has been designed that will not let you fall asleep at the wheel. It will zap you with an electric impulse. Steer is a wearable device that is packed with 16 sensors that constantly measure the user’s heart rate and skin conductance (galvanic reaction of the skin) – as per the product’s Indiegogo page. When you switch on Steer, for a minute, it analyzes your normal heart rate and skin conductance, and then it refers to these indicators to determine whether you are getting tired or not. If it senses your heart rate decreasing, it sends you a warning with a strong vibration and flash of yellow light. Think of it like a quick slap reminding you to wake up. If your heart rate keeps dropping despite the warning, the device will think you are about to fall asleep and will try to jolt you awake with an electric impulse. After you are shocked, the designers say, the levels of serotonin, noradrenaline, and cortisol in your body will increase, and the level of “sleeping hormone” melatonin will decrease. These changes will make you feel fresher and less drowsy and will return your heart rate to normal. This is when you should probably hand over the wheel, pull over, or find somewhere to actually get some sleep. The company says that, “To wake up on the road, drivers drink coffee, energy drinks, listen to loud music, smoke… These methods are harmful to our bodies or even dangerous to some of us.” If the device works like it says it will, it certainly looks like a safer alternative to other means of trying to stay awake while driving. “We are working on the accuracy of the sensors, completing research and tests. After that, other manufacture process steps will be happening. After completing each step, we will be updating you on our progress. We will do that each month, but if something will be completed in less than a month, we will write an update earlier to inform you. Hi I would uh le love to get one of those devices for a friend. They sometimes work 10 to 14 hour days .